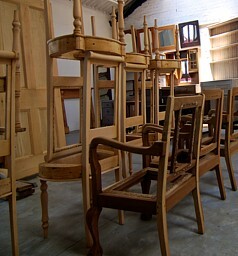 Our skilled workshop team has handled many different types of solid wooden furniture. Strippers has vast expertise in restoring hand-carved furniture, revitalising the expert workmanship of religious statues, as well as restoring large solid wooden gates, doors and windows. We also treat cane and wicker, SA Pine and items made of block-board and chipboard. Our practical experience extends from less conventional items, such as clock casings and musical instruments, through to restoration of buildings from the Victorian, Edwardian and Georgian styles. Wooden items older than 150 years have even been through our workshop with spectacular results. In addition we have cleaned, repaired and restored a large number of old and replica doors, windows, gates, wooden ornaments, frames, instruments and clock housings.